Let me start off by saying I never faced any problem in finding vegetarian food in Dubai. 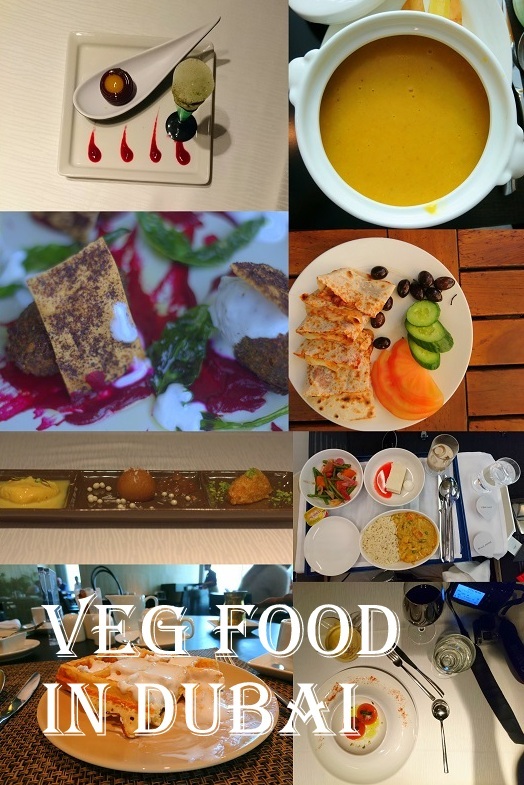 Right off from the flight with flydubai to the last meal at Meliá Dubai., there was always good vegetarian food available for me. I was pleasantly surprised by having a vegetarian option in the flight menu of the flydubai itself, there are some perks of flying business! There was rice, vegetable korma, cheesecake (I eat eggs) and more right in the flgiht. At the hotel breakfast had plenty of vegetarian options. Actually, breakfast almost anywhere in the world is good, more so because I do eat eggs. I could have salads, sprouts, fruits, cereals and then I would top it up with waffles! While traveling breakfast is my favorite part of the day. I ate a few meals at Meliá Dubai, I could order veg pizza, veg noodles etc. right off the menu. They used to make a great lentil soup, which I was told is a part of traditional Arab cuisine. But most of the meals we ate out, I think two of my lunches were in Dubai Mall. We sat out as the weather was great in December. On both occasions a variety of food, falafel, breads, wraps, Baked Alaska and the like were ordered and enjoyed. While sitting out for one of my meals, I once reconfirmed with the waiter if the food was vegetarian. He told he, “Daily at least 100 Indians come and eat here and they ask for vegetarian food. You have to trust me that it is vegetarian.” I stopped double checking after that! My feast came at Signature by Sanjeev Kapoor though. Signature for me is conveniently located at Meliá Dubai. I had a dinner there and it was a feast with tomato shorba, chat, pulao, dahi ke kabab, gajar ka halwa and much more! I also enjoyed a drink at the Skybar of Crowne Plaza in the festive city area. And while I am writing this, I am sitting at the airport waiting to catch a flight to Sharjah, Dubai’s neighbor. And once again I am looking forward to some good vegetarian food. PS. 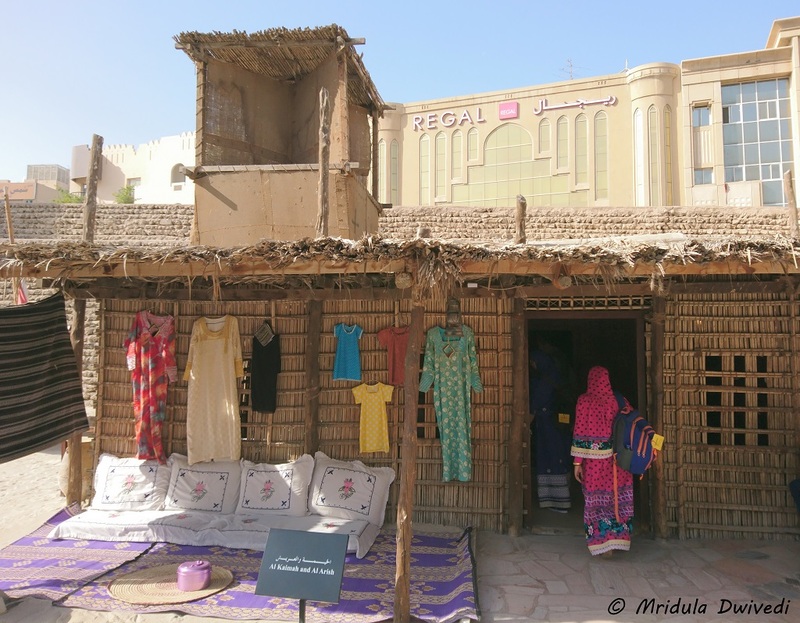 My trip to Dubai was sponsored by flydubai and Meliá Dubai. Before going to Dubai (on a FlyDubai FAM) I searched the net to know more about the dress code for women in Dubai. What I found suggested that it is better to dress on the conservative side. I also gathered that malls were the places where you could dress more liberally. Now, I am back from my trip and the following are my observations. The Courtesy Policy in Dubai! Most malls in Dubai display a courtesy policy for the public. You can see they advice covering knees and the shoulders which is very similar to the Buddhist temple policies. So a short sleeve T shirt and anything below the knee is fine! 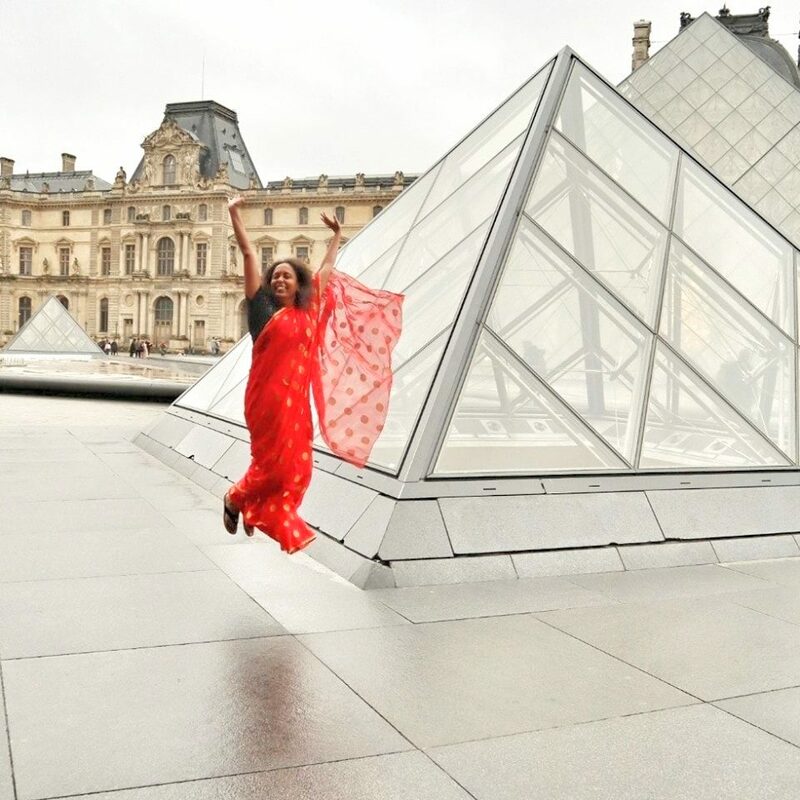 However, I love clicking what I see women wearing at a destination. A lot for them simply ignore the courtesy policy. Anyway all through the world official rules and there interpretations differ! 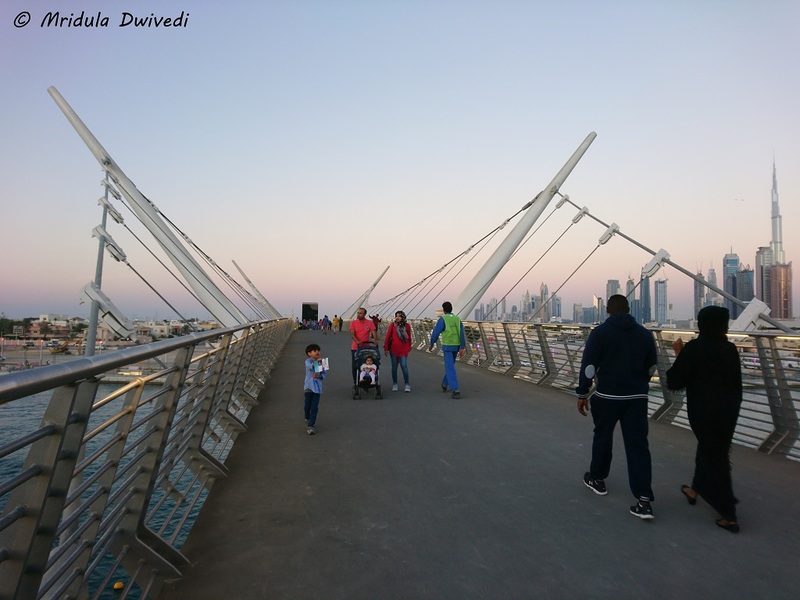 In December the weather was pleasant in Dubai, the days were warm and nights slightly chilly. 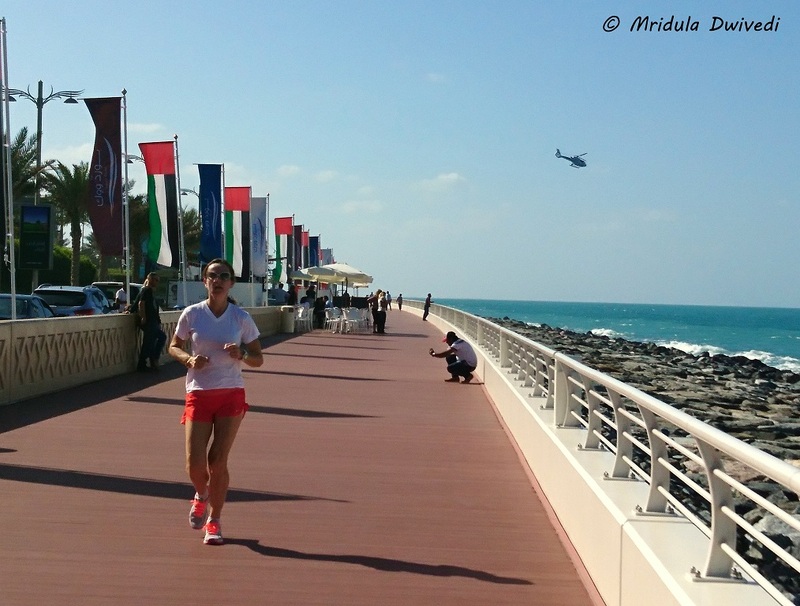 This girl who was out for a jog on a bright sunny day was doing so in a shorts and t-shirt in the Jumeirah area. I don’t think she attracted any extra attention. 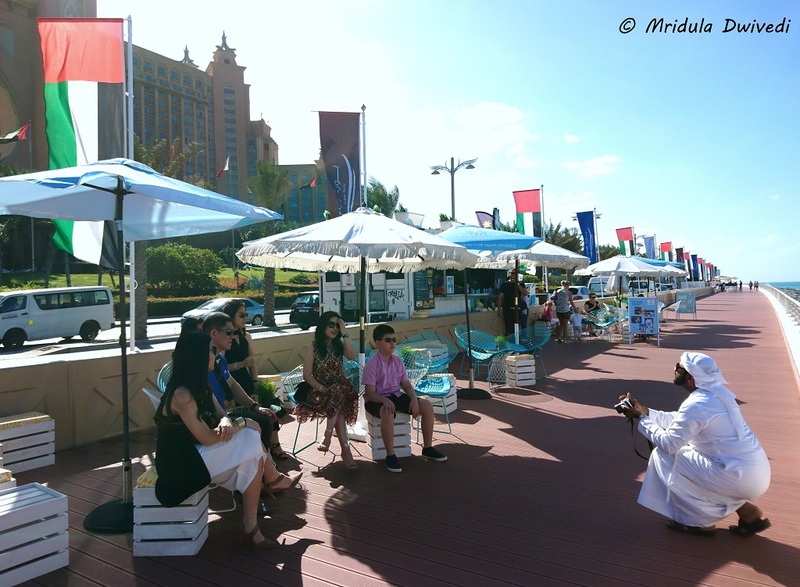 On the same Jumeirah Promenade I saw this photo session in progress. My guess is that the tourists asked the local to click a picture. And you can see the tourists are dressed like they dress anywhere on a holiday! For sure a lot of women (and men, see the picture above) dress conservatively according to their culture and norms. But you can see that even the official policy doesn’t expects the visitors to follow the same norms. I spotted the girls at the same mall where I clicked the courtesy policy. You can see clearly that the stated policy and the tolerated policy are starkly different. The Safa Park and Bridge! Even when it comes to conservative dressing the norms seem to be different, some just cover their hair and not the face while some would cover everything but the eyes! 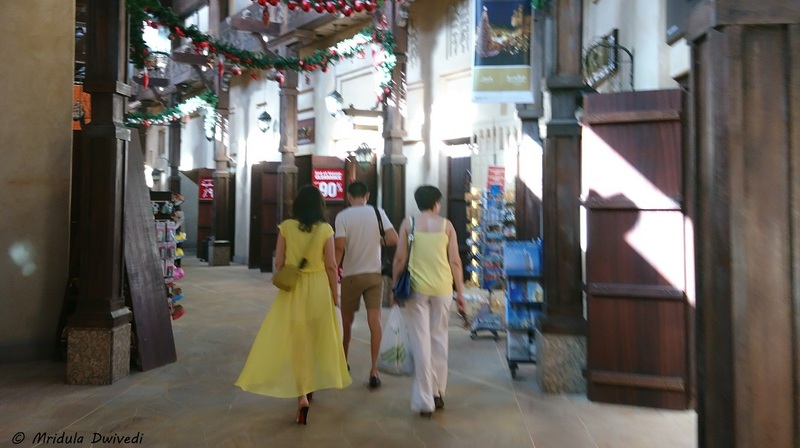 Dubai is a city of malls and like I said before, people dress nicely when they go out. 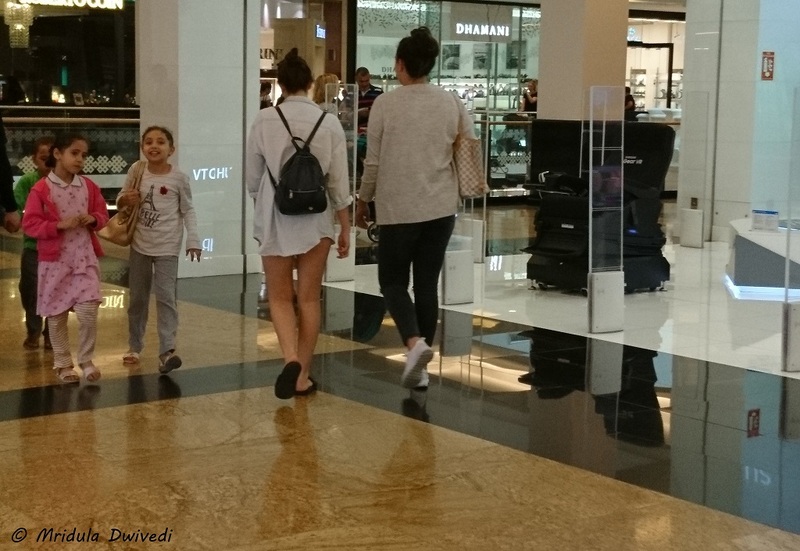 Mom and Daughter’s Day Out at the Dubai Mall! 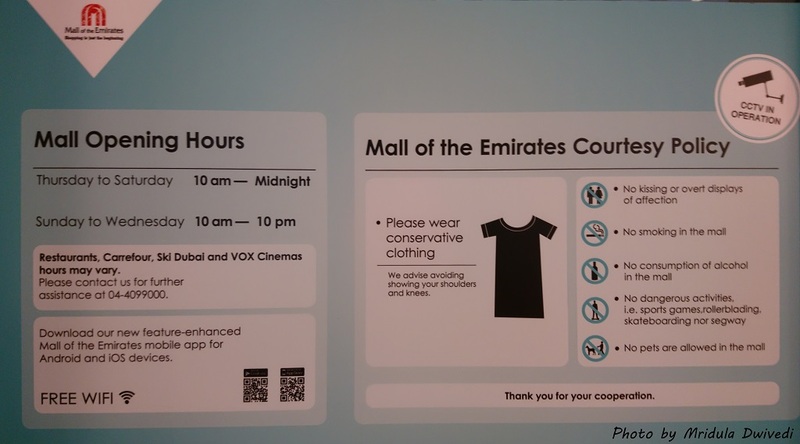 Dubai Mall has a similar stated policy as the Mall of Emirates (where I clicked the picture of the policy) and yet people interpret it in their own ways. 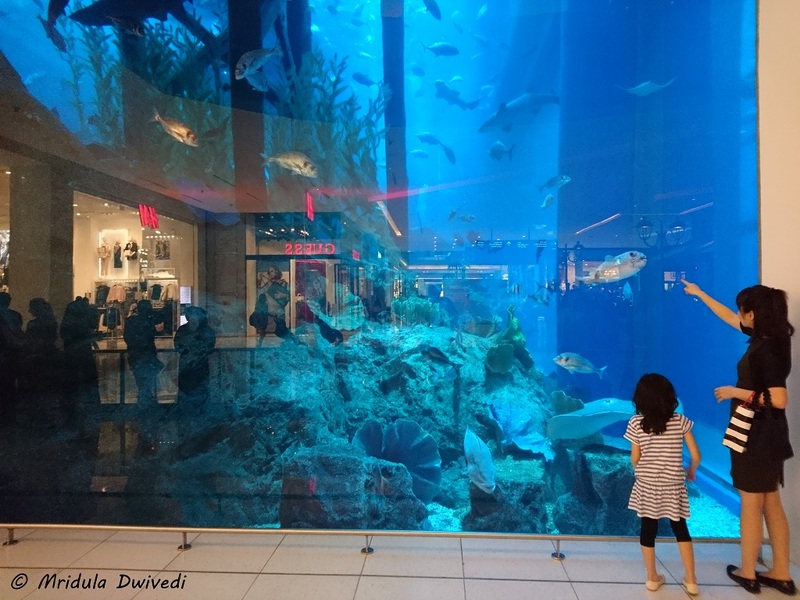 I spotted the mom and the daughter admiring the at the aquarium at the Dubai Mall. 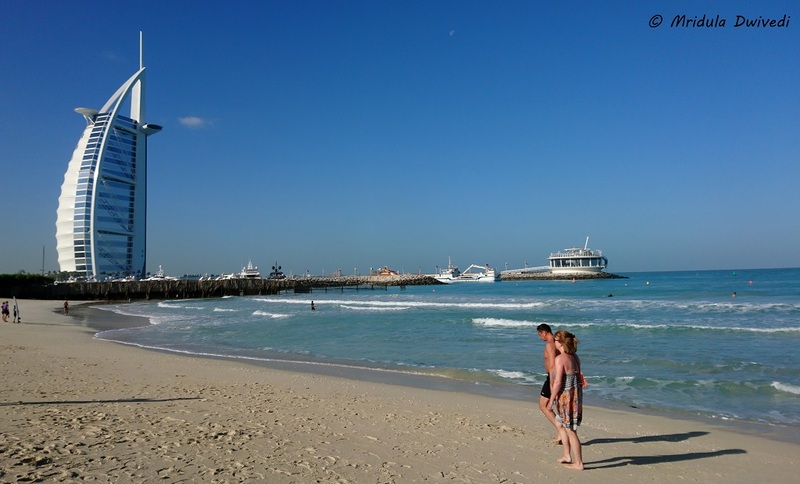 I briefly visited the Jumeirah Public Beach in the morning. The beach was not too crowded and I saw no one in a bikini. But I was told that it would get crowded in the afternoons and evenings and it was fine to wear a bikini on the beach. As you can see in the pictures there is a difference in the stated courtesy policy and what people follow. I personally wore something that covered my shoulders and knees most of the time. However, I wore a sleeveless top the day I went to the top of the Burj Khalifa. I leave it to you in the end to decide what you wish to wear in Dubai. I feel it is useful to know the stated courtesy policy but it is by no means written in stone!